Famed pro golfer turned golf course designer Tom Weiskopf reflects on his work at the former Adam's Rib Country Club course, now reborn as Frost Creek Golf Club. Weiskopf said the course is in his top five for mountain courses designed by his company. EAGLE — So much has changed at the former Adam’s Mountain Country Club property. A new name, new owners and new vision top that list. But something very vital has remained the same — the spectacular 18-hole, Tom Weiskopf-designed golf course still headlines the amenities at the newly christened Frost Creek Mountain Club. The man himself returned to the site this week and Weiskopf liked what he saw. Back in the mid 2000s, Adam’s Rib owner Fred Kummer contracted with Weiskopf to design the premier amenity at the mountain club he envisioned as a enclave for very discriminating members. As they laid out the plan, Weiskopf said the landscape actually dictated the hole placement. The topography also gave him the opportunity to employ something he learned back in his playing days. Weiskopf said when he competed at St. Andrews, he was impressed by the idea of a driveable par 4. Hole 4 at Frost Creek reflects that design. Some golfers will grip it and rip it and others will go for position. 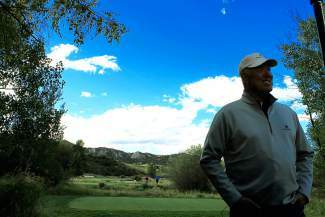 For his part, Weiskopf was enthused by the changes he sees at Frost Creek. The mountain club is no longer being marketed as a resort for the ultra-wealthy, but as a family enclave that offers something for everyone. “Things have worked out. The club has new life in Dan and Chad’s hands,” said Weiskopf. Back in May, a Denver-based ownership group led by investors Chad Brue and Dan Bennett paid $21 million to take over the former Adam’s Rib property southeast of Eagle. The group re-branded the former Adam’s Mountain Country Club as Frost Creek and more than tripled the number of club memberships. Additionally, the existing homes at the site have been sold or are under contract and an initial offering of 18 home sites has been released. Frost Creek Mountain Club sits on 2,655 acres and in addition to the Weiskopf golf course it features a 40,000-square-foot clubhouse with Olympic-sized pool, a tennis court and on-property fishing rights in Brush Creek. “There are amenities beyond golf, and there’s more things that can happen here,” said Weiskopf. Weiskopf’s company has designed 68 courses around the world, and his career has covered stints as a player, course designer and commentator. These days he resides in Montana and Weiskopf freely admits he is an unabashed fan of mountain golf. He has done 12 mountain courses. And regardless of who owns it or operates it, Weiskopf is obviously proud of the finished product. “Everything here is done first class,” he said.